How Do I Winterize My CableShade Canopies? To winterize your CableShades, simply retract and flip the flap. Nothing could be easier, and there are no extra steps! It takes about one minute to winterize each canopy, and you can even retract and flap in heavy-snow climates -- no need to remove them for the winter. Canopies retract easily on the stainless cables. Each order comes with a lightweight maneuvering pole. It takes about 10 seconds to retract each canopy. 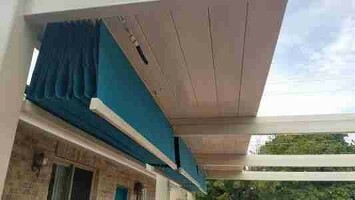 Canopies don't 'roll up' like other retractable systems, but gather accordion style-- leaving a breezeway to keep the canopies dry -- no mildew. For winterizing or for vacation times, simply retract, flip the hangdown flap over the fold and add the two crisscross bungees. You can also opt to have clip-on carabiners (with minor extra charge) if you desire to pull your shades down for the winter. How Do I Operate My Retractable Canopies? Your system will include a Sky Hook that easily maneuvers the canopies along the cables. Extend the CableShade canopies in the spring and leave them locked out all year until threat of snow in the fall. Simply unlatch and retract back (accordion style), then flip the flap over and side-bungee for the winter or vacation times. It literally takes about 10 seconds to retract each canopy and another 30 seconds to winterize. 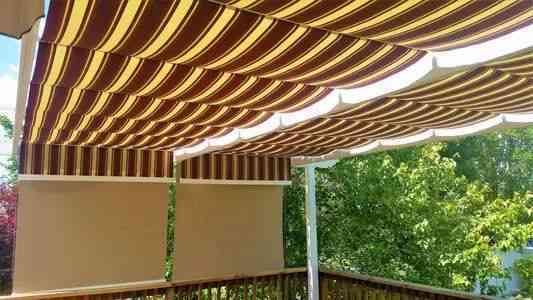 Will CableShade Canopies Work For My Particular Home? CableShades can attach to almost any house curvature such as a flat wall or wrapping around a bay window. The top canopy can extend on the level so the canopies can project outward up to projections longer than 15 feet. The retractable canopy can also work on sloped applications. See our photo gallery to view our many different designs. How Long Do Fabric Canopies Last? CableShade retractable canopies use top of the line outdoor 'marina' fabrics that, if maintained annually for the change in seasons, can last up to 15 years or beyond. CableShade canopies are custom designed for long term durability and should not require annual service. The cables and most component parts are high grade stainless steel. Why CableShade canopies are superior. Are CableShade Retractable Canopies Waterproof? 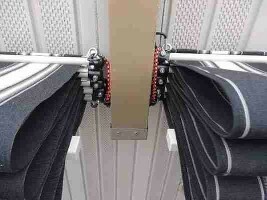 Yes, CableShade uses top of the line Sunbrella Marina outdoor fabrics that repel water and protect from overhead rains. What Are The Sizes of Canopies Available? Standard sizes are 50" or 64" or 84" widths (eyelet to eyelet for each shade placemets), but CableShade Retractable Canopies can be customized to nearly any size to fit your deck or patio. The length (projection) can be most any increment needed. With just adding more canopies the overall width can be as wide as needed. Projections are typically 12 to 15 ft., but can be extended up to much longer lengths with simple mid-support J-hooks. How Much Do CableShade Canopies Cost? The CableShade system is far less priced than other ‘individual retractable canopy systems.’ Most orders will cost from $13 to $15 per square foot -- depending on if using 50" or 64" or 84" sizes. 10% upcharge for custom-sizes. Please email us with dimensions and include pictures if possible, to request a price quote for your project. View our Price and How to Order page. Does the CableShade retractable canopy/awning really work in high winds and heavy rain? These canopies actually do work in high winds because of the separation between canopies and the buoyancy of the cables constantly releasing wind pressure. CableShades wider than the 64" size can have added decorative grommet drains for drainage of excess rain. How Quick Can I Have My Canopies? How About That Late Western Sun? Drop down vertical blinds can be easily added to most any (level) surface. These can be purchased from Lowe’s; Home Depot; Cosco, etc., for about $100 for a 10’x7’ (largest size). These vertical blinds are very easy to install. Drop down vertical blinds are best if used in a Mesh fabric rather than the same opaque fabric as the canopies. The Mesh comes in standard widths of 6 ft., 8 ft. and 10 ft. sizes and range from 70% to 90% sun block. If the blinds are intended to match the overhead opaque canopies fabric then the maximum width is 5 ft. per blind. Is the Installation of Retractable Canopies Difficult? Installation requires about 30 minutes per canopy on an existing pergola or trellis. Simply install the eyelets at desired 4 points (4 corners) per canopy; thread the cable through eyelets and the canopy; connect turnbuckle and tighten to desired tension. If projection is over 15 ft. J-hooks can be simply added in the middle to prop up a long projection. Personal assistance is available for the do-it-yourself customer. Don’t have an existing Pergola/Trellis? Call for assistance. 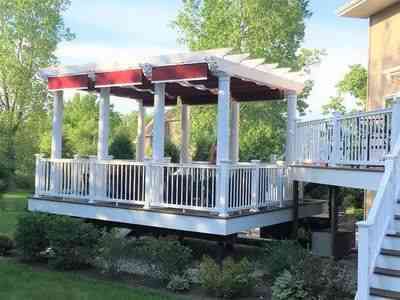 In most areas there are pergola builders standing by. We can provide assistance if you are a do-it-yourself builder. CableShade canopies can remain in extended position from spring through fall seasons -- even through most high winds. They must be retracted in threats of snowy weather. Note: CableShade Retractable Canopies are individualized sections that retract individually ( 84" or 64" or 50" 'widths' standard sizes). No CableShade can be wider than the 84" width. They can extend at any increment up to approx. 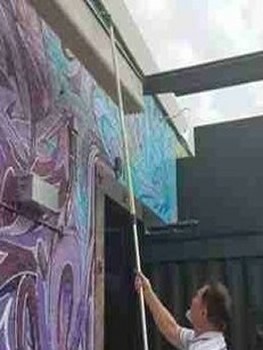 30 ft. Note: A Retractable Awning is often a term one uses to describe the same thing as 'retractable canopies.' Generally speaking, however, an awning is one large size sewn-together fabric like you see on some of the "crank out" awning TV adds. Those crank out awnings are a whole different ball game when it comes to wind pressure release and the rain/snow issues.